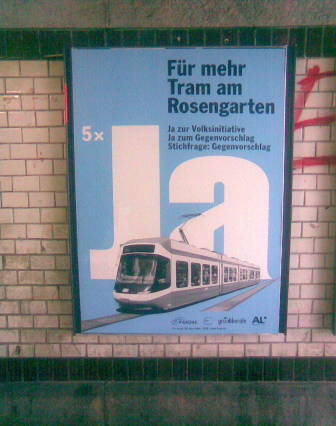 The approaching referendum (28th November) include an item on the proposed tram project on Rosengartenstrasse. 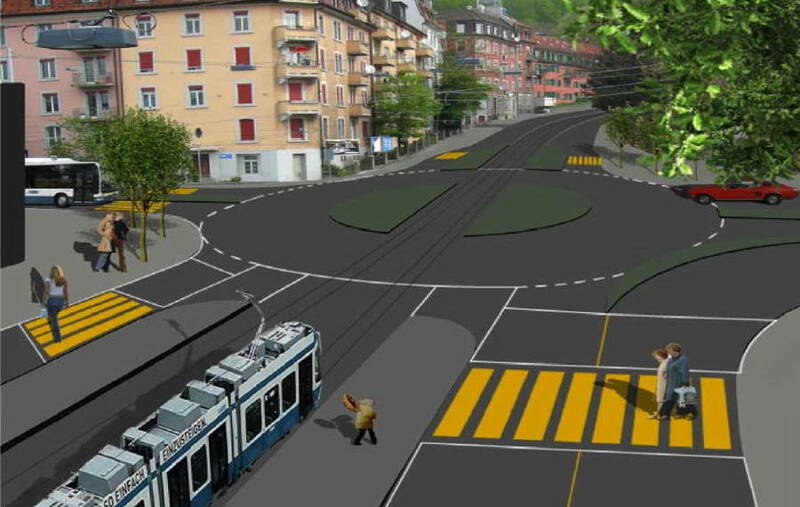 This project goes back to VBZ's Vision 2025 (published in 2006), which recommended that by 2020 a tram line should be built from Milchbuck to Albisriederplatz basically replacing trolleybus 72. The new line would both improve service to the rapidly developing west of Zürich, while also providing a tangential connection so that people can travel from one area of town to another without passing through the centre. Rosengartenstrasse, however, is no ordinary street but an important and heavily used traffic thoroughfare connecting two bits of motorway. A tram would constrict road capacity. To relieve pressure on this route, another project would be required, that of a new road tunnel called Waidhaldetunnel. Combining both projects was a clever move by the town council as it would have solved the impasse between the pro-road lobby demanding the tunnel, and the pro public transport lobby demanding the tram. These well laid plans have been overtaken by an initiative that seeks to have the tram line built without the tunnel, and is seeking the approval of 31 million Franks for this. A counter proposal by the city parliament proposes that bus lanes be provided as an interim measure for 4 million and a further 5.4 million for a tram pre-project (which I believe is mostly about studies). The city executive council, including Andres Türler, who is responsible (among others) for VBZ, is opposed to both variants. On 8th November voters will have to cast a vote for both variants and a third to decide which will be realised if both get a majority. Some observers are saying that this is an unfortunate development. The tram project can not be realised without cantonal support, and the Canton will not be likely to support the tram without the road tunnel. The referendum might well end up being a meaningless decision. It might even be counter productive as many voters may vote no due to doubts, with the pro-road lobby interpreting this as anti-tram sentiment, so potentially wrecking a project that otherwise has majority support. Personally, I remain undecided as to whether this is a wise move. 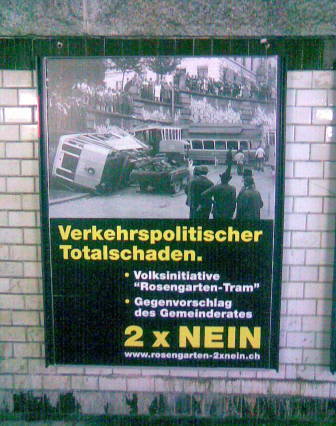 Below are some of the posters of the pro and anti side, providing an interesting comparison on the ways trams are used to transport a message. The accident on the 'no' poster actually occurred on Gloriastrasse in 1930 when a driver lost control of a tram running downhill. 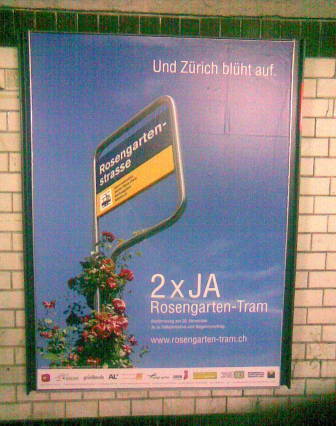 The 'yes' lobby has a website to promote their cause: www.rosengarten-tram.ch.